Etta Edwards Geer, age 96, of Rutherfordton, went home to be with the Lord Wednesday, August 24, 2016, at Rose Hill Retirement Center in Marion, NC. She was a native of Rutherford County the daughter of the late Martin Harrison Edwards and the late Winnie Willis Edwards. 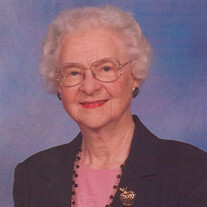 She was a member of the First United Methodist Church of Rutherfordton for close to 60 years. Etta loved her Sunday School Class and working with the youth group in her younger years. She was preceded in death by her husband Glenn H. Geer, two brothers; Coy and Ray Edwards and one sister Mary Ikard. A special niece Patsy Hughes, a special nephew Jack Edwards and special cousins Douglas Hayes and Tommy Allison and several other nieces and nephews. The family will receive friends from 11:00 AM to 12:00 PM, Saturday, August 27, 2016 at McMahan's Funeral Home. The funeral service will be at McMahan's Funeral Home Chapel at 12:00 PM, Saturday, August 27, 2016 with Reverend Ned Owens officiating. Interment will be at Rutherfordton City Cemetery. In lieu of flowers memorials should be made to Hospice of Rutherford County at P.O. Box 336 Forest City, NC 28043 or to the Outreach Ministry of First United Methodist Church of Rutherfordton at 264 N. Main St. Rutherfordton, NC 28139. An online guest register/tribute wall is available at www.mcmahansfuneralhome.com. McMahan's Funeral Home is in charge of the arrangements.